….Or, JJ Abrams and Co. Urinate on Trek….Again, Only Worse! OK, let me begin by saying, YES, TREK FANS, THEY REALLY DID IT!!! Our worst fears are realized…..
By now, only people with their heads up their posterior do not know that Khan is in this movie. 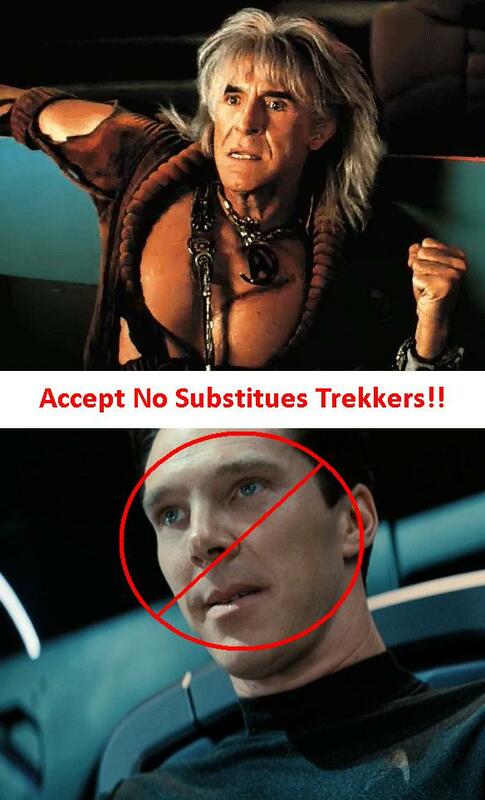 Yes, that Cumberbatch guy is Khan. John Harrison is like JJ Abrams reputation: BULLSH*T! I tried to give this Trek incarnation a chance. I really did. I didn’t mind the first movie, even with its too much reliance on the Butterfly Effect to explain differences nonsense. Even with the pathetic mockery that was Simon Pegg’s portrayal of Scotty. I mean, they killed Winona Ryder! How could I not at least give them the benefit of the doubt? Well, they wasted it. Once again, JJ Abrams and his writers are hellbent on alienating what is still one of the biggest fanbases in movie history. The only thing is, I think Trek fans are so hungry and desperate for any trek that they will put up even with this insult and bastardization. I mean, they put up with Brannon Braga for how much B.S.? And, so many think just because Abrams had a hit with “Lost” that he can do anything. Sorry, folks. I didn’t like Lost. I thought it, like the reboot of Battlestar Galactica, or in comics the Night of Owls/Trial of Owls storyline in Batman, was an interesting idea that went on WAY TOO DAMN LONG and was looking for an ending. I mean, I don’t watch TV to get a headache trying to figure out what my show is about. Not entertaining. But, your mileage may vary. So, we are expected to believe that the Butterfly Effect that gave us Kirk as a dropout in New Trek 1 also moved back Khan’s foray into space back to the 1950s (do the math,people, when you see the film. We are expected to believe that this same butteryfly effect makes Spock a supreme badass and James Kirk an uncertain little whiner like Anakin Skywalker. Seriously? Does Abrams have such a dislike for Bill Shatner and the Kirk character he would urinate all over Kirk’s essence and make him a mockery? OK, it wasn’t all bad. In fact, up until the last 25 minutes, I was ready to say, ‘ok, while not my Trek, it wasn’t a complete slap in the face….I might go on…) But then….THEY…DID….IT…. Even with the first opening sequence, I got a feeling that they were going to ruin the greatest Trek movie ever, because I heard “The needs of the many….” But no…they wouldn’t…Yep…they would! But first, the good. The film is visually stunning. Saw it in 3d, even though I hate 3d. However, the 3d in this actually was good. It wasn’t overpowering. It wasn’t over the top. Also, we finally saw less humanoid aliens in Starfleet. It wasn’t portrayed as just a “homo sapiens only” club. I liked the officer caps, even though it isn’t Trek. I liked Chris Pike’s admiral uniform (basically a mod of Kirk’s admiral uniform from Star Trek the Motion Picture). We finally got some Klingon action, though sadly not enough. And, we got to see the Dreadnought class…. The Bad…Or, to Paraphrase the Original Dr. McCoy…. JJ Abrams, whether the Trekkers out there buy it or not, took a dump on Trek with this movie. First, it is a bastardization of the classic episode “Space Seed” mixed with “Star Trek II.” And it gets little correct except the names of characters and ships. Some fans may believe the “this is an homage’ garbage, but that isn’t what it is. It is JJ and co. want to phone it in, so they got lazy and just ripped off the genius of Harve Bennett and Nick Meyer. So much wrong here. Khan is a homicidal, genocidal but charming maniac. Cumberbatch’s version might as well be an android. Khan is not to be sympathized with, as we are supposed to do with this version. Sorry, not buying it. Carol Marcus? Really? So we are going to lay out the groundwork for little David. But seriously, is the CnC of Starfleet’s daughter really going to be able to stow away on the flagship? Come on. Also, british? Seriously? And a weapons designer? Which brings me to this…. Too much reliance on the Butterfly Effect to explain so much nonsense…OK, if this timeline is different because of the events of New Trek 1, then only everything after would be effected. But no, we are now led to believe that it changed the nature of the eugenics wars, it turned Khan from Indian to British, it made Spock a badass and Kirk a wimp? Come on now…. And I thought that the use of Leonard Nimoy as Spock.1 was a cute touch in the first New Trek, going back to that well only exposes the weakness of the overall plot and course of this new Trek universe. If you have to keep going back to the original universe to keep this story moving, then the story is very weak. And this version of it really is weak. Taking the most amazing and poignant scene in Trek and making it a joke. You really did this? Disgusting and shows how little you actually know about the show. Simon Pegg continues to be a walking talking mockery of James Doohan. While it was toned down in this film, it was still insulting to a very gracious actor and person. Underwater Enterprise? Enterprise in planet atmosphere? Really? Seriously? And Starfleet is just now starting the five year deep space missions? Then why in the heck has Enterprise been out exploring? And what is it with Spock being the main protagonist? Why is he the guy going after the bad guy? It is ridiculous! This film is an affront to the greatest parts of Trek. No offense to Chris Pine, Karl Urban, and Zach Quinto. They did fine performances as Kirk, McCoy, and Spock. Urban continues to strike the perfect chord in his version of McCoy. Quinto is growing into Spock, as is Pine. His hair and his demeanor were more Kirk this time. However, the sad and pathetic self congratulating cuteness of what they did with the Khan character and storylines, coupled with the continued ridiculousness of their portrayal of not just Scotty but also Chekov make this film an insult to Gene Roddenberry’s vision. To paraphrase a certain political talk show host, “I hope it fails.” While many might say, but NewHopePatriotMissile, you still got your trek, and the way they do this allows they still can do Wrath of Khan…” I say, BULLSH*T! This film makes me ill. I would sooner there be no more Trek than the continued slaps in the face Paramount is putting out with this overrated hack JJ Abrams in control of the franchise. This film gets 0 out of 5 shields. Don’t waste your time. Go out and get Star Trek the Original Series on Blu Ray and Star Trek II: The Wrath of Khan on Blu Ray and watch true inspired storytelling. This is like a cheap knock off.